U.S. Air Force. Via Wikipedia Commons. Variants The A-26C had a transparent nose and only two 0.50 nose machine guns. It was often fitted with radar. The A-26 Invader came into service in 1944 and was the fastest U.S. bomber of the war. It was derived from the A-20, but was even hotter and more heavily armed and armored, with 6 0.50 caliber nose machine guns. In addition, the top turret could be locked forward to contribute to strafing firepower. Some were modified in the field to carry up to 22 machine guns. With its heavy gun armament, it was a very potent strafer and proved particularly effective in the anti-shipping role. 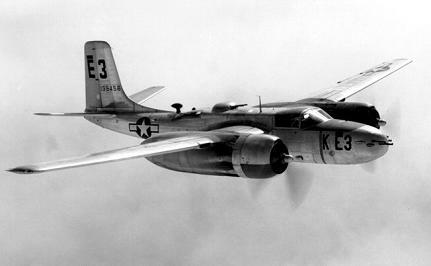 It was also equipped with rockets, but these turned out to be unsuitable for low-level strafing attacks: The fast-moving A-26 was almost on top of the target when the rockets hit, and was in serious danger from the debris kicked up by its own attack. The A-26 was slow to come into production because of disputes over the correct nose armament configuration, which originally was to include a 75mm nose gun. A proposal to design a modular nose that could be swapped for different configurations proved impractical. The aircraft was later redesignated the B-26 (not to be confused with the B-26 Marauder, which had been phased out by then) and was still being manufactured as late as 1963 for use in Vietnam. Although the A-26 made its combat debut in New Guinea, only about 20% of A-26 crews were deployed to the Pacific.